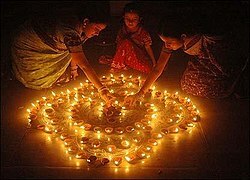 Arrangement of diyas on Diwali night. I have to say that I am no expert in Indian sweets and delicacies though I grew up in Malaysia and Indian is one of the 3 major races in the multiracial harmonious society. Diwali or Deepavali or Divali (Festival of lights) is round the corner and Indians (pardon me if I am wrong) throughout the world will be celebrating this festival on the 3 November 2013. It is a public holiday in many countries including Singapore and Malaysia. If you want to learn more about the significance and celebration activities of this important Hindu Festivals, you can refer to Wikipedia’s explanation on Diwali. Of course, as part of a multi-racial society, I want to join the celebration by blogging some Indian cuisines. 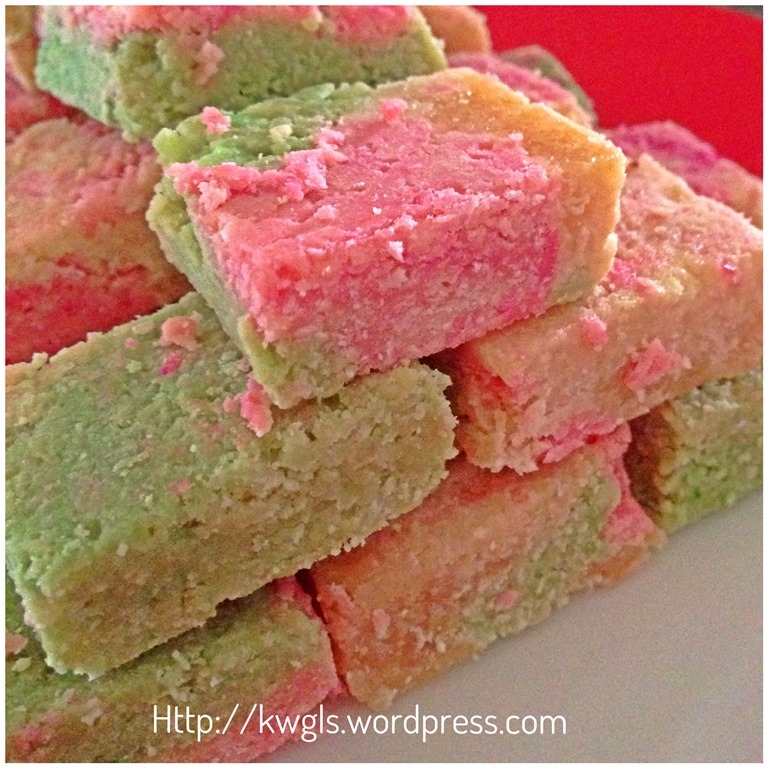 The most immediate Indian cuisine that came to my mind is a type of Indian coconut candy (COCONUT BARFI) that I loved. Frankly speaking, I did not have many chances of eating this candy because it is not easily available in Singapore or Malaysia. It could be due to my ignorance of the places that sell this candy but in my about 16 years in Singapore, I can only recall one Indian restaurant that sells this candy. I remember when I took my very first bite of the candy many years back in Malaysia, I immediately fell in love with it. As I have very limited knowledge on this candy, I shall refer you to Wikipedia on a brief explanation of Barfi. I have managed to get a recipe for this Coconut Peanut Candy . 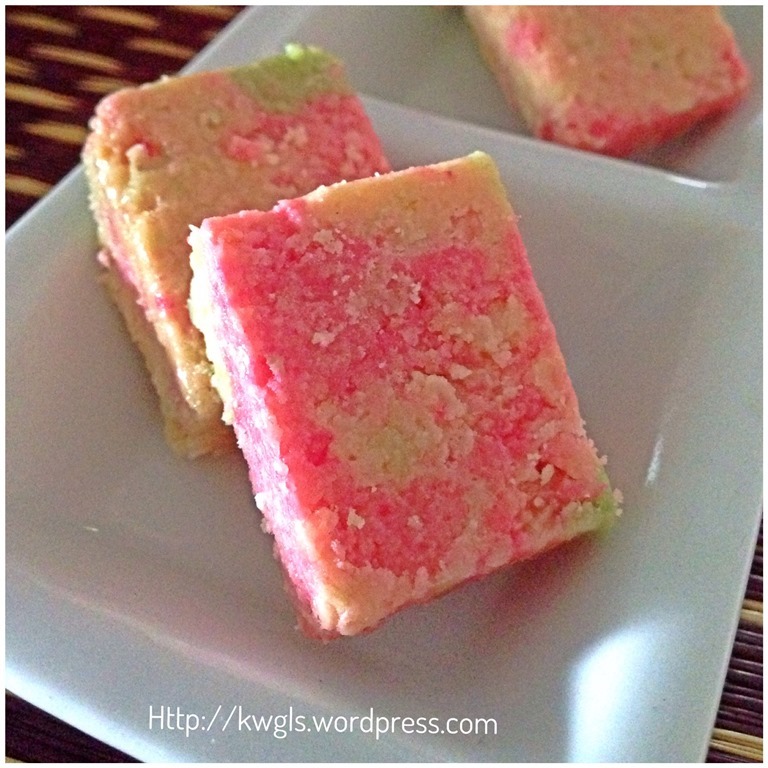 However, since I do not have peanut with me, I have made some pure coconut Barfi instead. 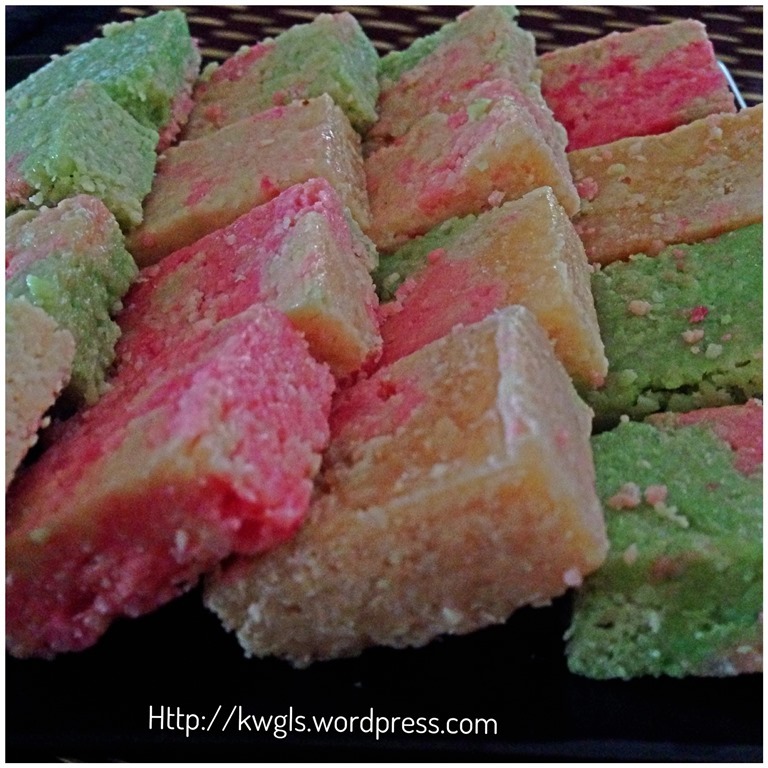 As the coconut Barfi that I bought and tried are mostly green and red, therefore, I have added some permitted food colouring to it. 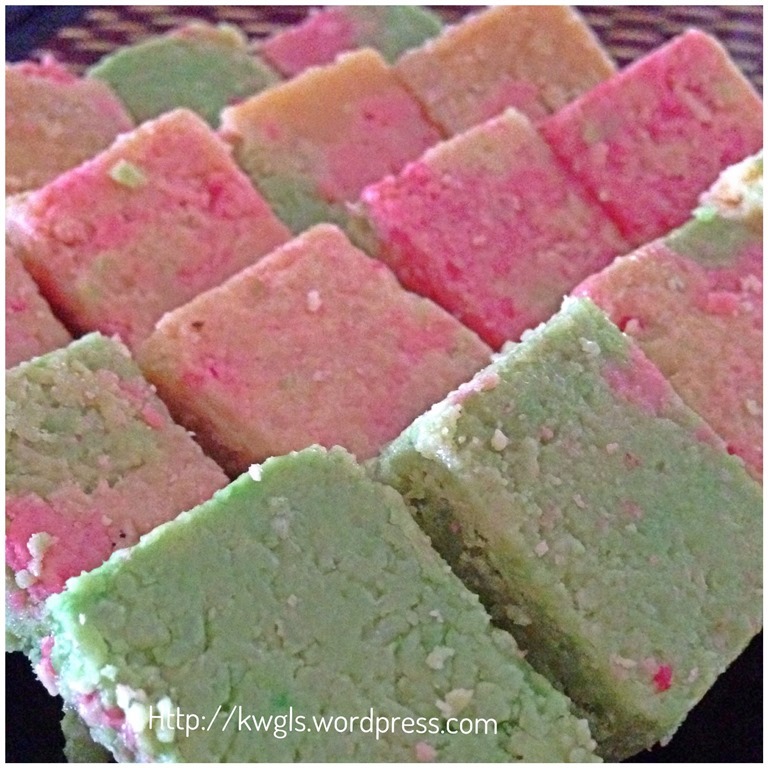 Due to my inexperience of moulding and colouring, the look of my coconut Barfi today look is less than satisfactory but you can just safely omit the colouring and come out with this delicious coconut Barfi. 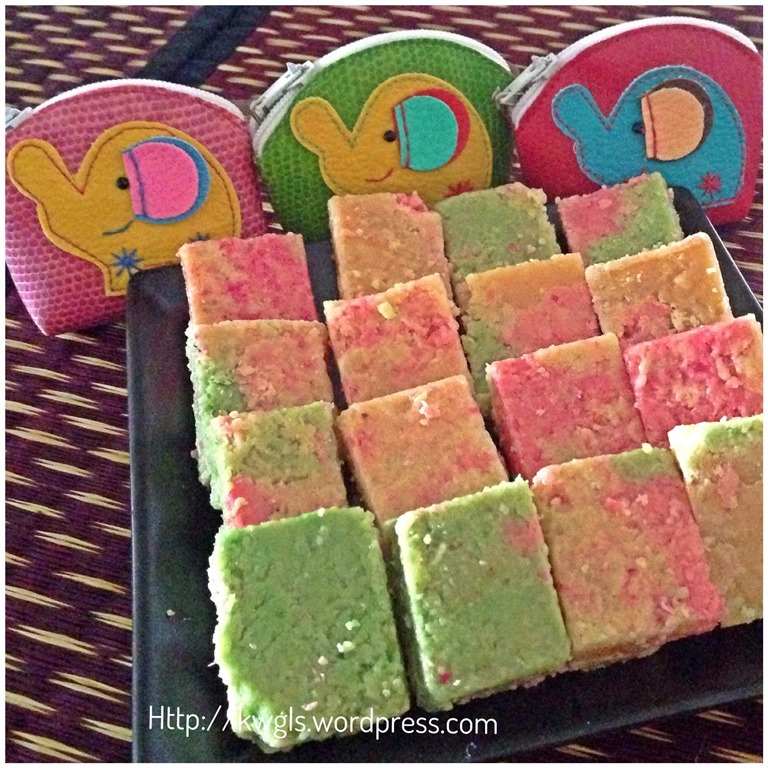 The taste of the Barfi is awesome and full of coconut aroma. The sweetness of this recipe is just right for me. In my previous purchases of this candy, it was usually too sweet for me until it hurts my teeth. In a big non-stick sauce pan, add in sugar, grated coconut and condensed milk. Heat using medium heat until it boiled. After it boiled, turn to low heat and continue to cook until all the milk thickens. 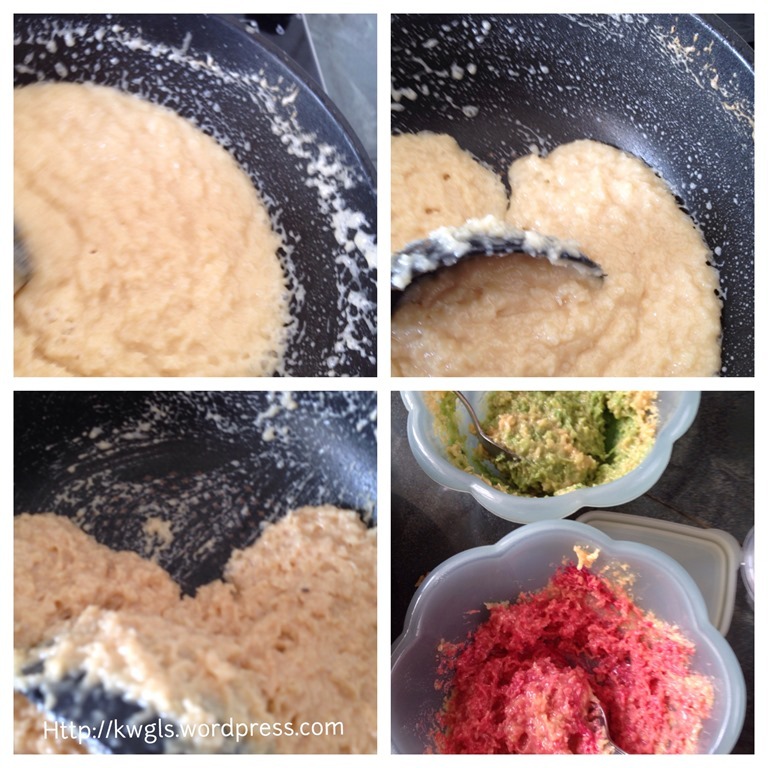 You have to constantly stir the mixture to ensure that it is not burnt. The milk will gradually thicken and be patience. In my case, it took about 30 minutes to thicken. 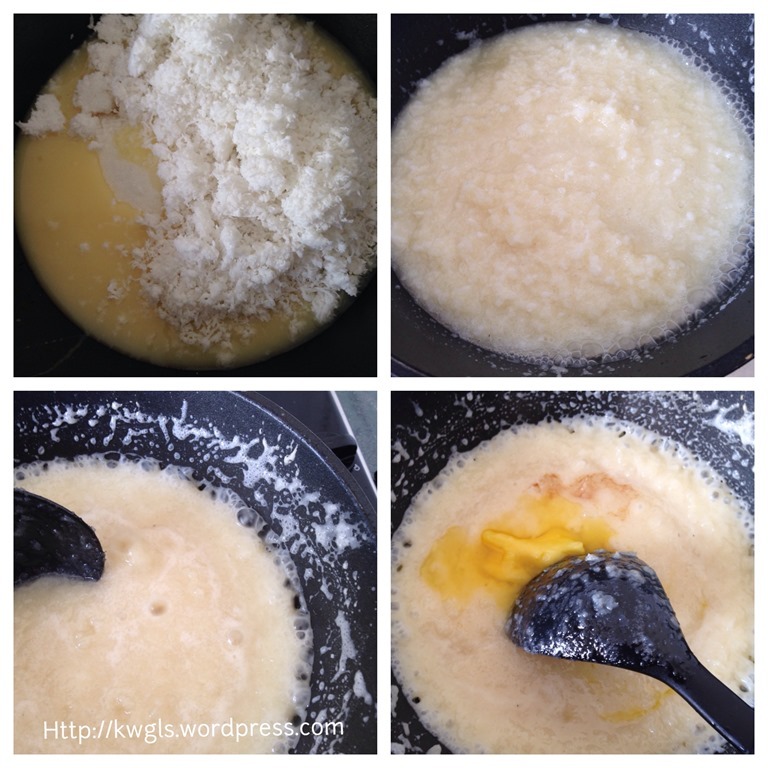 Thicken means the milk and sugar starts to solidify and leave the sides of the pan. 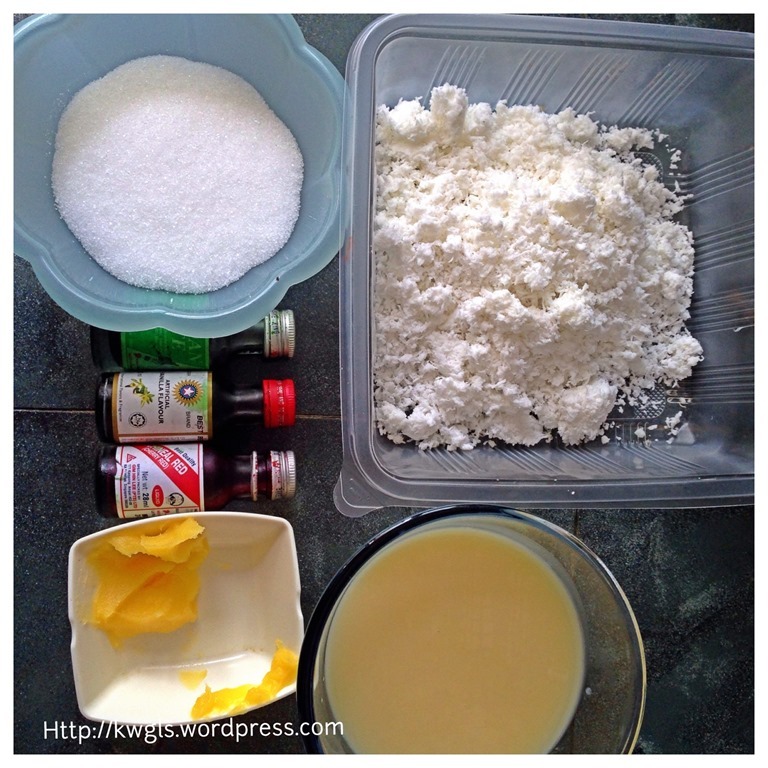 .Add in ghee and vanilla essence. Continue stirring and get ready for next step’s of moulding. 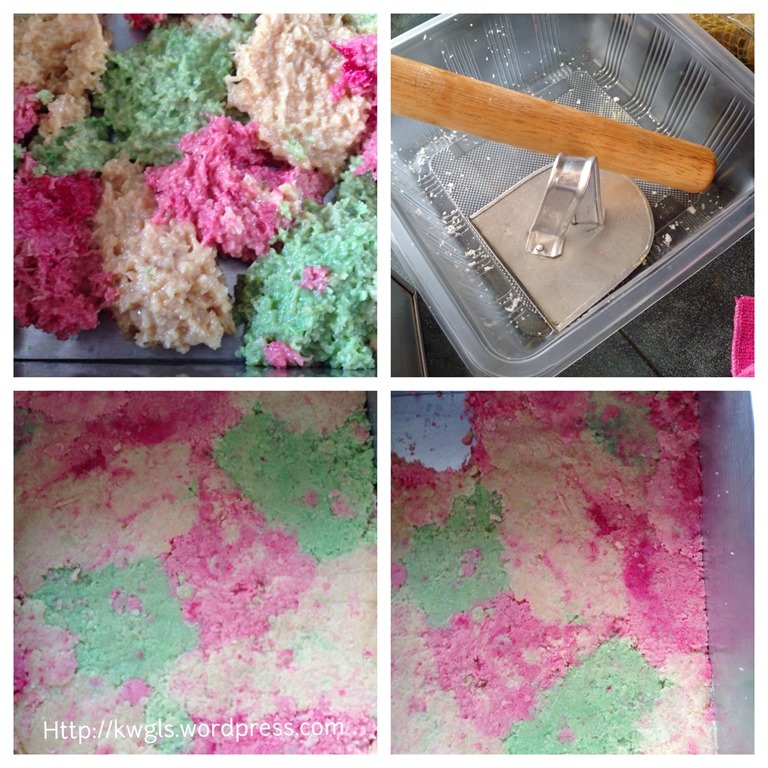 Pour all the candies into the lightly greased baking tin. Level it as much as you can into your desired thickness. Let it cool completely before cut into desired shapes. Personally, I found that the most difficult part of the entire recipe is the moulding. Possibly if you omit the colouring part, the whole process will be easier and gives you more times to mould. Melted sugar solidifies very much once it touches the air (without any heat). It is rather easy but takes time to boil the milk but the taste of the candy is worth the efforts. I like to take this opportunity to wish all my Indian readers a HAPPY DIWALI FESTIVAL 2013 and other reader a HAPPY DIWALI HOLIDAY. 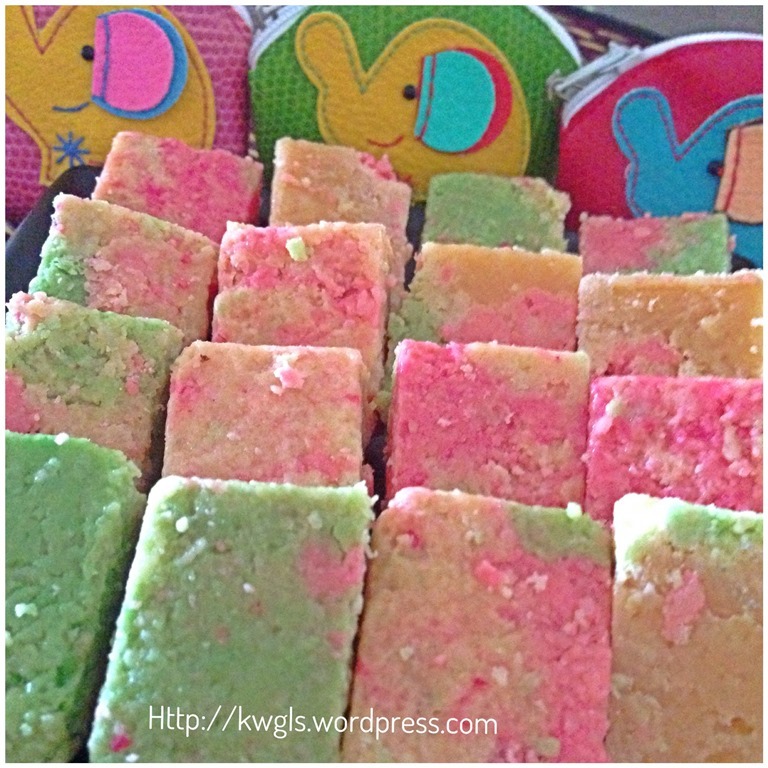 This entry was posted in Desserts, Food Preparation Series and tagged 8, cocont candy, Coconut Barfi, diwli 2013, grated coconut, Guaishushu, Indian Barfi, postaday. Bookmark the permalink. I have never tried this candy, but I wonder if I could find it in a local shop or restaurant in San Francisco. Thank you for sharing with us about this holiday and the countries where you have lived. It is all very interesting! Sounds really good and looks, as always, amazing. Thanks for linking to #recipeoftheweek 🙂 Pinned!